Pictured here, a 777-300ER in Qatar Airways livery. LE BOURGET, France, June 17, 2013 /PRNewswire/ -- Boeing [NYSE: BA] and Qatar Airways today announced agreements for nine Boeing 777-300ER (Extended Range) airplanes at the 2013 Paris Air Show. The agreements include a firm order for two airplanes previously attributed to an unidentified customer on Boeing Commercial Airplanes Orders and Deliveries website, plus a commitment for an additional seven airplanes. The total value of the agreement is $2.8 billion at current list prices. "With its reliability, economics and range capability, the 777 will continue to play a key role in enabling Qatar Airways to operate more direct non-stop flights from our hub in Doha to destinations in many markets including Australasia and the United States," said Qatar Airways Chief Executive Officer Akbar Al Baker, speaking at a press conference at Le Bourget on the opening day of the Paris Air Show. "We have already shown a desire to open up new destinations in the U.S., and the Boeing 777 will further feature in our expansion plans in this part of the world." 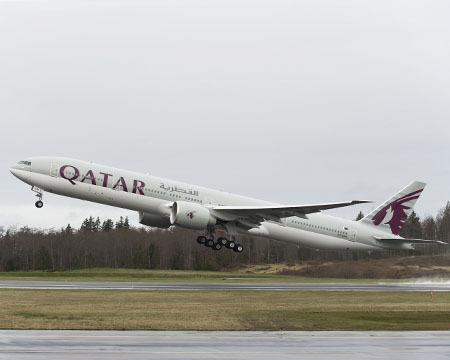 "It is a great honor to have Qatar Airways operate the 777 as its long-haul flagship aircraft," said Ray Conner, president and CEO, Boeing Commercial Airplanes. "The 777's unrivaled economics and customer-preferred passenger experience make it a cornerstone of Qatar Airways' success." The demand for the Boeing 777 led to an increased production rate of 8.3 per month -- 100 airplanes per year -- in February 2013. In the past three years, the 777 program has increased rate two times, first from five airplanes per month to seven in 2011, then to the current, all-time high rate of 8.3.